With the stream of Leopard kits being offered at the moment, it is only natural that after-market products follow quickly. Among these manufacturers, Legend have offered two conversions kits for Danish Leopard 1 versions, the SFOR 1A5DK-1 (LF1282) and the UN 1A5DK (LF1283). Both of these conversions are great. However, one of the real disappointments of the Meng kit - was not dealt with by Legend - were the road wheels. This is where Leopard Workshop have come to the rescue. 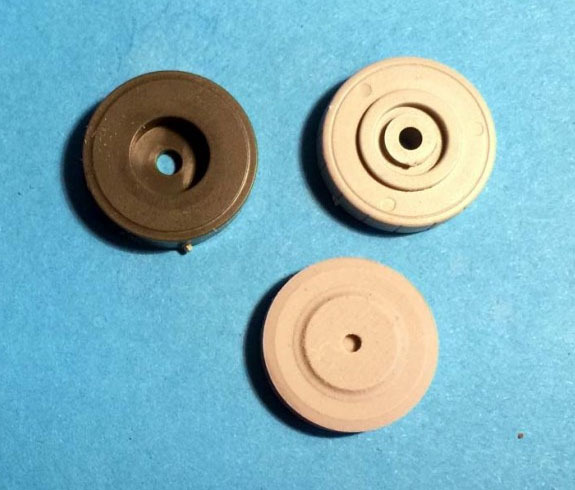 They initially made a set of replacements wheels, kit no. LW001 (soon to be replaced with LW001-1), which were by far the best kit of road wheels around for the Leopard tank. Now they offer four sets of bolted road wheels/idlers to complement their first set. All deployed Danish Leopard tanks in the Balkans had refurbished road wheels of three different kinds - plain bolted, Allen bolted and recessed Allen bolted. To make the best of Legend's conversion kits, the modeller would have to tackle this issue. However, this is not an issue anymore thanks to Leopard Workshop. The refurbished road wheels were also used by both the Canadian army and the Norwegian army, so the potential for these kits is vast. The kits are sold in bags of four in kit nos. LW007-4 and LW007-6, and in bags of two in kit nos. LW007-3 and LW007-5. The first two versions, Allen bolted and recessed Allen bolted, are the most common ones and therefore sold in bags of four. Only two idler wheels are needed and the plain bolted road wheels are much rarer, so each are sold in bags of two. Each bag only contains the front wheel faces. The 'block' seen below behind the wheels is one I placed to lift the wheels a little for the photos. These wheels are designed to fit with Leopard Workshop's own sets of road wheels (kit no. LW001-1 and LW002) and a future set of road wheels arms (LW011 coming later this year). They also fit Italeri, Revell and Perfect Scale Modellbau's road wheels as shown in my picture. 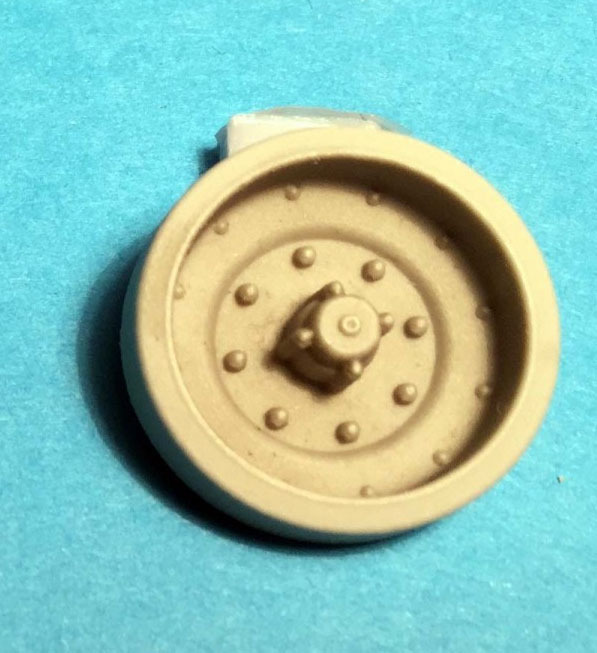 This does, however, give the modeller a minor issue with aligning them with the road wheels nearest to the hull - they have to be eye-balled in place as there are no connection marks/pins to aid you apart from the axle hole. I hardly think this will stop any modeller. 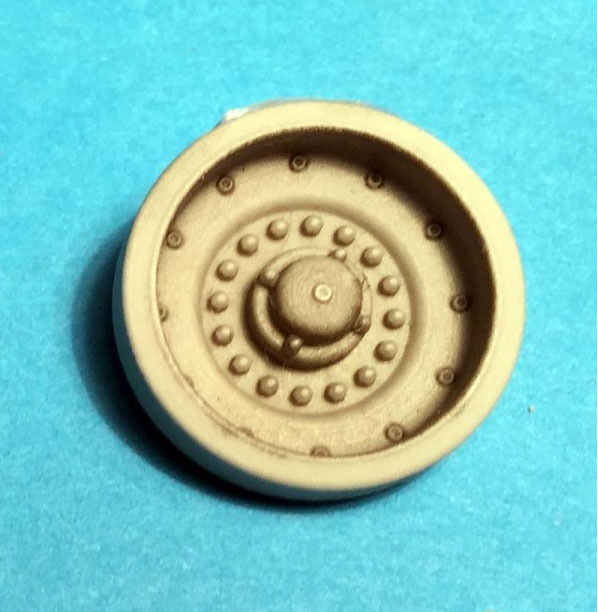 Some might have found it convenient if they had fitted Meng's/Takom's road wheels. This is not an easy task to do. 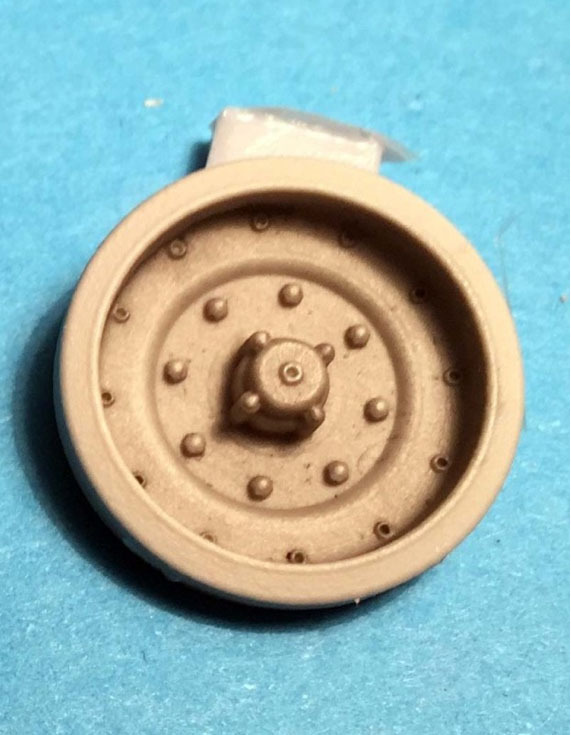 If placed on the inner road wheel directly there is not enough space for the guide horns because the Meng/Takom inner wheels are completely flat! To solve this, a 10 mm diameter disc made from 0.5 mm plastic card has to be made as a spacer. The inner wheel would then show its over-scaled thickness. However, they are best replaced anyway. 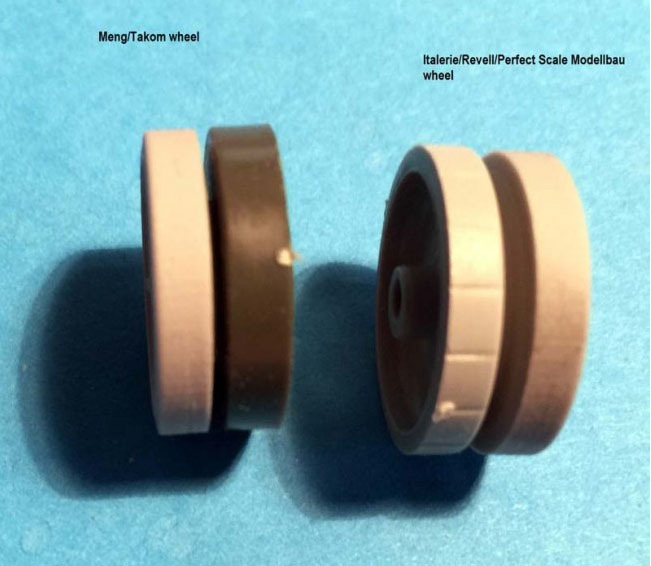 Both Meng and Takom wheels are far too thick, poorly moulded and have a ridiculous drum brake-like disc on the inside. Rear face comparison from Meng and Italeri (top) and Leopard Workshop with correct profile. Because the Meng (and similar Takom) wheel has no spacer, their is no room for the track guide teeth. These wheels are too thick anyway. 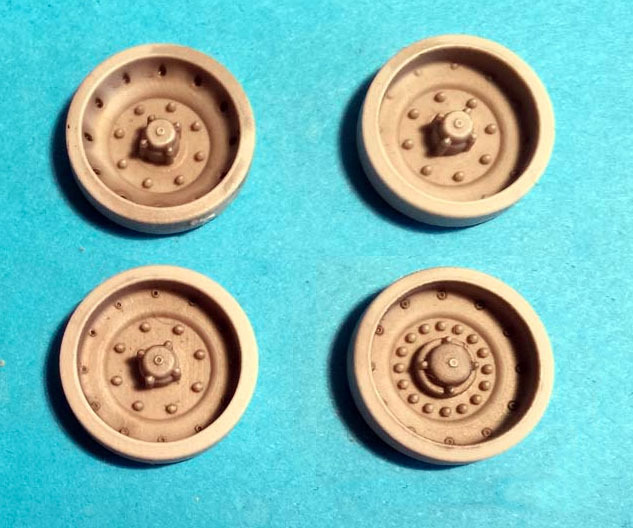 The LW wheel works with the Italeri/Revell/PSM wheel, though it is meant to work with the other Leopard Workshop wheels LW001-1 and LW002. The wheels have been designed using CAD technology and the masters produced using 3D printing. As such, they are highly detailed and will give the modeller some very impressive road wheels. There is no casting block to deal with and therefore the preparation is minimal. My copies have been cast absolutely flawlessly and almost ready for use as they are. 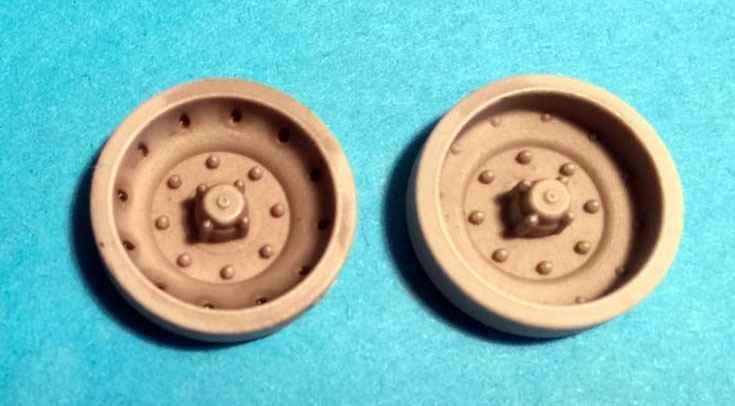 For modellers wishing to make a Danish Leopard in the Balkans, I would urge you to study your references closely as these road wheels replaced the original ones over the years. No two tanks are alike, nor would the same tank have the same kind of road wheels during its entire life. To make the details of the wheels stand out more clearly, I have given the wheels a coat of Tamiya Panel Line Accent colour. There is also a set of spare wheels in the line (LW006). Very high quality items that are packed in small numbers thus allowing a high degree of individuality. Easy to use. You need another set of road wheels if you are building a Meng/Takom kit. This is a very necessary addition to Legend's two Danish conversion sets. Highly detailed, well produced and fairly priced and packed, I think this is as good as it gets for such a specialist area of the Leopard 1 tank. I highly recommend these wheels.